Eagle Superabrasives is an American supplier of diamond sharpening wheels. We specialize in the production of precision diamond and CBN grinding wheels and other Superabrasive supplies. With an extensive inventory of over 6,000 diamond, CBN and CDX wheels, we are able to ship ninety-percent of orders in the same-day. We use the correct bonds for the job, and can produce wheels on more than six different core materials. If you’re looking for high-performance Superabrasives and superior customer service, contact the experts at Eagle Superabrasives. Diamond Sharpening Wheels are great for working with difficult to grind (DTG) materials. Diamond being the hardest materials known to man, does a great job at staying hard and cutting cool under high pressure environments as is encountered during the sharpening and grinding process. Understanding the breakdown of diamond sharpening wheels is essential when considering a diamond wheel as an investment. The rapid wear of diamond sharpening wheels can be linked to heat buildup causing the breakdown of bond. To help battle this problem, wet grinding will always benefit the wheel life, sometimes increasing wheel life by 4 times. Our diamond sharpening wheels are built with in-house designed advanced formulas and bond systems ensure your wheel won’t break down rapidly under wet or dry grinding conditions. Considering that the concentration of diamond in the wheel will also benefit the wheel life and performance. If you have an increase of diamond concentration up to 125% in the wheel, the performance of the wheel increases greatly. The higher concentration of diamond allows the pressure of each individual particle to take on its own share of pressure, causing a decrease in the overall pressure of each particle. In the industry, this is known as the extent of hardness in the wheel. When the diamond abrasives fracture easily, it is known as a soft bond. Hard bonds can hold up to large forces due to the fracturing being restricted. 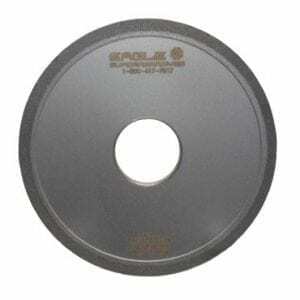 You would typically use a soft wheel for surfaces that are easy to cut. Hard wheels last longer than soft and are used for finer surface finishes. When you’re ready to try the best, trust the experts at Eagle Superabrasives. Our experienced staff will provide support and advice along the way. With unparalleled customer service, superior products and fast shipping, Eagle Superabrasives is an easy choice for all your grinding needs. Contact us today to place an order!